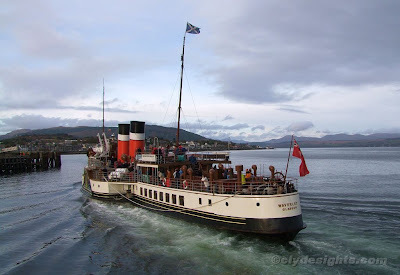 Since leaving the Clyde at the end of August, WAVERLEY has been cruising on the south coast and the River Thames, but returned to the Clyde mid-week to undertake a few final sailings before being laid-up for the winter. On Sunday afternoon, she cruised from Glasgow to Tighnabruaich, and is seen here making her final call at Dunoon for the season, before heading back up the river to Glasgow. For today's calls, she reverted to using the old pier. I saw this elsewhere and must admit it is a splendid, and different, shot.